Earlier we have discussed about Aakash (World’s Cheapest Tablet).Now the countdown is over and the much awaited Aakash tablet is finally ready to sale. DataWind, the Canadian company that is manufacturing Aakash, has started the online booking and pre booking of the much anticipated low cost Android tablet. Online booking is for students' version of the tablet and pre booking is for UbiSlate 7, the upgraded version of Aakash. The commercial version of Aakash tablet will be powered by Android 2.3 and will have a resistive touchscreen, Cortex A8-700 MHz processor and graphics accelerator HD video processor, 256 MB of RAM and 2 GB of internal memory. Other specifications are a one standard USB port, 3.5 mm audio jack, a 7 inch display with 800 x 480 pixel resolution, resistive touchscreen, GPRS and WiFi support. "The improved version of Aakash tablet will be available in retail outlets by January end," a spokesperson of DataWind told media. The tablet was to be made available in retail stores by the end of November. "The delay in the availability of the tablet has been due to upgradation in the tablet and some unforeseen delay in manufacturing," the spokesperson said. 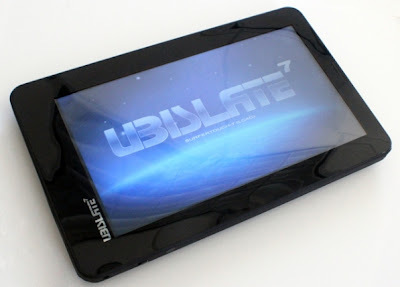 In case of pre booking users will get a confirmation message which will state, "The commercial version of the Akash UbiSlate 7 would be launched in early weeks of December. After the commercial launch we would get in touch with you to deliver your device as soon possible." As a matter of fact, the confirmation message a reader will see is factually incorrect as The mobile Indian had reported earlier the Aakash tablet will be available only by January end.